F/T11 Opening "From Kenji Miyazawa/Yumenoshima"
Locals may already be familiar with the enormous theatre buildings of Bunkamura in Shibuya, the New National Theatre in Hatsudai, or the intriguing architecture of Za-Koenji Theatre, but Tokyo also boasts Japan’s biggest theatre festival. For the past three years Festival/Tokyo, one of the Tokyo Culture Creation Project’s enterprises, has hosted playwrights, actors, dancers, directors, choreographers, set designers and producers from across the seas, as well as celebrating all that is vibrant and cutting-edge in the local theatre scene. The projects on offer this year, ranging from the energetic to introspective, come together under two interrelated themes. In a similar fashion to many of 2011’s major visual art events, this year’s Festival/Tokyo felt compelled to respond to the impact that the triple tragedies of the March 11 earthquake, tsunami and resulting nuclear crisis have had in current Japan. As Program Director Chiaki Soma says, 3.11 is a “grand narrative” that has impacted not only on the North-East of Japan, but the whole country. It has shattered the lives of many and brought doubts about the future to millions of others. The Festival asks, in the wake of these changes, what can we say through theatre? More than any visual art event so far, Japan’s largest theatre festival has responded strongly to the ongoing political issues raised by these disasters. In particular, “Referendum Project” takes inspiration from the many public demonstrations against nuclear power that have been held since 3.11. Conceived and directed by Akira Takayama, this is an interactive, fictional referendum through which Takayama wishes to extract a more pure form of democracy – something he sees lacking today in Japan. An installation truck will be stopping at sites around Tokyo to show video interviews with school children expressing their feelings on Japan today. Visitors can then “vote” on how they feel about the situation, as well as attend forums and talk events. The truck tours to Fukushima on November 5 and then brings the results back to Tokyo for a “closing rally” on November 11. 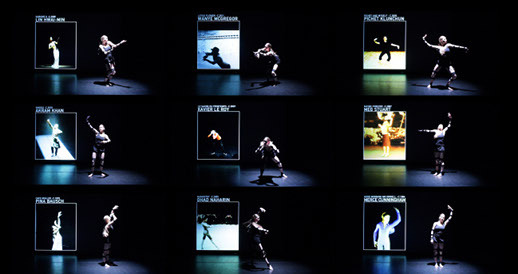 Akio Miyazawa’s production, “Total Living 1986-2011”, was also one of the productions to bluntly take on the nuclear crisis as its subject matter. The play was set in two times – the year of the Chernobyl nuclear meltdown in 1986, and the present day in Tokyo. Miyazawa’s focus was on the things that have changed, or haven’t changed, between the Bubble era and the current 3.11 world. Another major theme for this year’s program is that of taking theatre out into new outdoor spaces. One of the Festival’s regular main venues, the Metropolitan Arts Space, is currently undergoing renovation work so hosting lots of open-air performances was always going to be a part of this year’s program. However, this theme, combined with the new post-3.11 “grand narrative”, now brings out many more opportunities for new socially charged interaction between the public and forms of theatre and performance. For the opening night, a double-bill of outdoor plays by Romeo Castellucci and Norimizu Ameya took audiences to the artificial island of Yumenoshima, located in Tokyo Bay. The choice of location – an island created to incinerate Tokyo’s mountains of garbage – draws focus to those normally out-of-sight things (like nuclear power plants) that are necessary for the city to function. 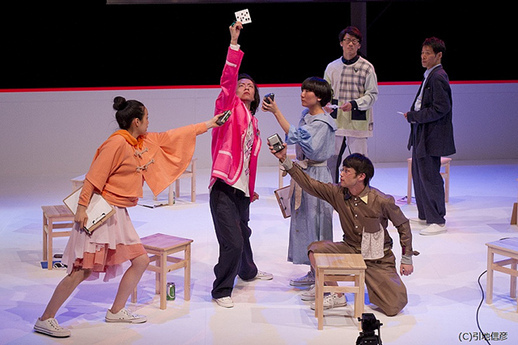 Popular Osaka-based theatre group Ishinha took their audience out of the theatre and onto an Ikebukuro rooftop for “Landscape – Tokyo, Ikebukuro”. The theatre troupe used choreographed movements to imitate everyday impressions of urban life. Sitting on the rooftop, the play offered the chance for the audience to simply observe and listen to the city scene surrounding them. The train cars rolling along the rails, the occasional blast of a horn, traffic along the streets below, and the glow of neon lights were all part of the backdrop. Ishinha’s ode to the city presented the actors as anonymous figures, imitating the inanimate buildings and objects that make up the Tokyo landscape. Not all the program is so serious. Some of the Emerging Artists Program participants generate a childlike sense of pleasure and play with the city. 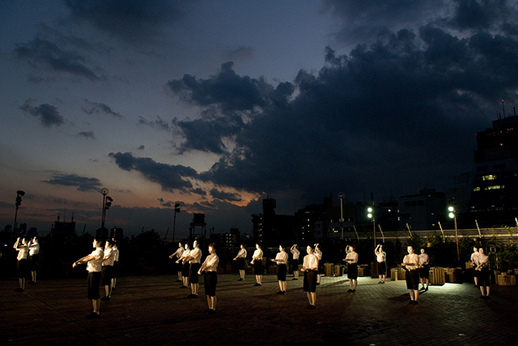 Peachum Company draws on the symbolism of Tokyo Tower and is also performed outdoors. 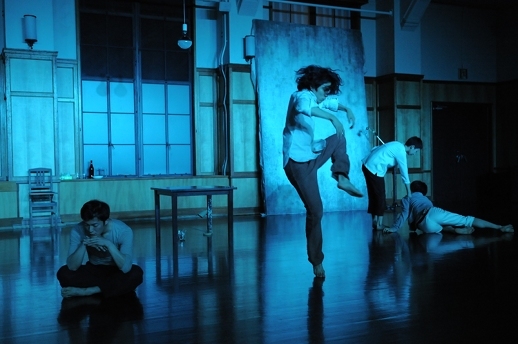 Their performance, “Resurrection”, will be staged in Shiba Park with English commentary and it runs until November 4. The intriguingly named Pure BANANA girls class present frenetic idol-inspired song-and-dance productions proclaimed as the theatre of the girls’ generation. Their performance, “BANAGAKU★☆Super Spunky Sports Autumn Grand Tournament!!!! !”, runs until November 1 with English surtitles. In the main program, controversial art unit CHAOS*LOUNGE is in some ways like the boys’ version of the BANANA girls, drawing on otaku (geek) subculture in their art projects. CHAOS*LOUNGE will be presenting “CHAOS*EXILE”, two installations recreating key subculture motifs and spaces in Tokyo’s otaku heartland, Akihabara, until November 6. In addition to its strong local following, Festival/Tokyo has also been attracting many overseas guests and non-Japanese residents. This year is no exception. To overcome language barriers, the Festival’s website highlights productions with English surtitles, including OKAZAKI ART THEATRE’s “Hemispherical Red and Black” (until November 6). Additionally, French- and German-speakers were treated to René Pollesch’s epic outdoor work “Cinecittà Aperta, Ruhr Trilogy Part 2”, and will also be able to enjoy some of the satellite programs in the F/T Theatrotheque, a program of theatre-related films and documentaries from Europe and Japan. Singaporean media artist Ka Fay Choi’s “Notion: Dance Fiction”, investigating the line between the digital and the physical, is also highlighted as a work performed entirely in English. There are also a number of productions and performances that do not have a language barrier because they are mostly visual and/or without Japanese dialogue. Needless to say, the dance piece “still life” by Tsuyoshi Shirai (until October 30) will be universally understood, as will the performance by Korean group Modern Table in the Emerging Artists Program. 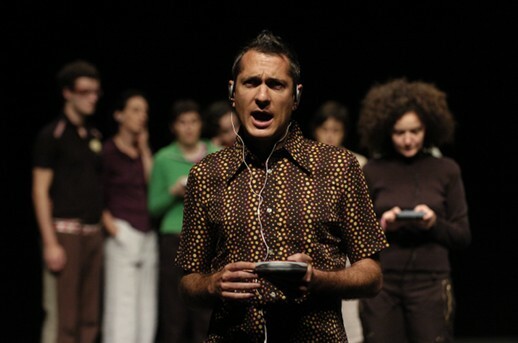 Jérôme Bel’s “The Show Must Go On” originated in France but is in fact made up of famous, English-language pop songs. This is a highly awarded, ambitious experimentation on the nature of dance, using non-dancers and non-actors recruited locally. Eastern or Western, young or old, this is one production that is recommended for everyone. It will run in Saitama on November 12 and 13, closing this year’s Festival. TABlog also previously published an article on Festival/Tokyo 2010.